More than one in twenty cases of serious head injury in Chinese children is cause by child abuse, a new study shows. The first study to investigate the causes, characteristics and trends of pediatric traumatic brain injuries in China, conducted in 77 hospitals, found that falls were the leading cause of traumatic brain injuries for all ages but peaked at 2 years of age. Other common causes were being struck by/against objects and traffic collisions, the study of 4200 cases of paediatric traumatic brain injury found. Boys were more likely to have brain injury than girls, accounting for 77% of injuries. The proportion of traumatic brain injuries caused by traffic collisions ranged from 10% in children 0–2 years old to 19% in 3–6 year olds. Among the traumatic brain injury cases caused by traffic collisions, the largest proportions were among motor vehicle passengers, bicycle/tricycle riders, and motorcycle riders, and each of these categories accounted for about 20% of the crash-related TBIs in each age group. There were 125 brain injures in 0–2 year olds (6% of all injuries in this age group) that were caused by suspected child abuse. Suspected child abuse was significantly more likely to occur in infants under one year of age. 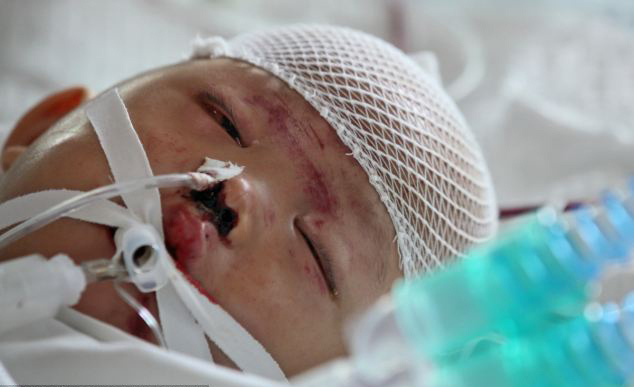 "Traumatic brain injuries caused by child abuse warrant further research and government attention as a social and medical problem in China," conclude the researchers form the Wuhan Children’s Hospital in Hubei. Due to the lack of any legal requirement for doctors to report suspected child abuse it is very likely that brain injuries caused by child abuse were under-reported in the study., the researchers add. "We could only report these cases as “suspected child abuse” because a systematic legal procedure for confirming suspected child abuse cases does not exist in China," they note.